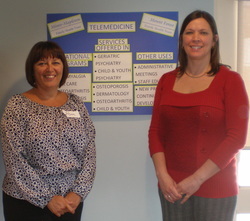 The Minto-Mapleton Family Health Team is pleased to be a part of the Waterloo Wellington Telemedicine Program. Telemedicine involves using secured two-way videoconferencing through the Ontario Telemedicine Network (OTN) that connects patients with specialists and other health care providers. The OTN is one of the largest telemedicine networks in the world. This technology will give our local patients access to many different types of specialists without having to drive long distances to see them. Examples of such specialties include: psychiatry, dermatology, general surgery (for pre- and post-op appointments), pediatrics, respirology, osteoporosis, and assessments by a Geriatrician. Stay tuned for future additional specialties. For more information, please contact our Telemedicine Nursing Coordinators: Pam Turton at pturton@mmfht.ca, or Tracy Livingston at tlivingston@mmfht.ca.